Is it Safe to Install a Higher Wattage Power Supply in My Computer? - Ask Leo! Is it Safe to Install a Higher Wattage Power Supply in My Computer? Replacing a power supply is common solution to some problems. Making sure you have the right wattage power supply is important... and bigger doesn't hurt. I want to upgrade my current case that has a 300W PSU to a nicer looking case, but it has a 520W PSU. Is it ok and how does the “W” difference influence PC operation? It’s quite all right, and if things were working well before, you probably won’t notice a difference. Let’s look at why, and just what that “W” means. I get questions on this topic frequently. The “W” stands for “watts”, which is a measure of electrical power. Power supplies are rated by the maximum amount of power they can deliver. That means a power supply rated for 520 watts can supply more electrical power than one rated for 300 watts. That’s more electrical power. It won’t make your computer run faster or give you more “computational” power — this is only about the electricity required to operate your hardware. If your computer has been running well on a 300-watt power supply, then it doesn’t need a bigger one. But there’s nothing wrong in using a bigger one. It’s possible that a new, larger power supply might be a little more efficient or perhaps even a little quieter. But your computer will continue to use whatever it was using before, which we know is less than 300 watts. That your new power supply might be capable of providing more is beside the point. Your existing power supply has failed, or is in the process of failing, and is no longer able to produce the power your computer requires. It might be rated at 300 watts, but due to whatever is failing, it’s not capable of providing it power any more. As it fails, unexplained crashes usually become more frequent. You’ve added hardware in the form of add-in boards, memory expansions, additional hard drives, or other devices that draw power from your computer, and you’ve exceeded your power supply’s rated capacity. This, too, can behave like a failing power supply. In either case, the solution is a replacement power supply. In the first case, a power supply with the same rating as your old one will do; in the second case, you’ll need one with higher wattage rating. If you’re going to replace your power supply, I typically recommend replacing it with one that has a higher wattage rating. It hurts nothing to do so (other than, perhaps, your wallet, depending on how far you go). More to the point, it makes your machine more capable of supporting additional hardware power requirements in the future. I’ve heard concern that a high-wattage power supply can somehow “force” power into the computer, causing overheating and burnout. Nothing could be further from the truth. A power supply supplies power in response to need; it doesn’t push power anywhere. If your computer only needs 100 watts, then a 500-watt power supply will only supply 100 watts. Why have a 500-watt power supply? For “peak” usage (sometimes hardware requires sudden “bursts” of power, such as at start up or under high load) and for future expansion. It’s better to have too much power than too little. Two important aspects of power supplies, replacement or otherwise. If you do replace it, get the right size. By this I mean physical size — there are several standard sizes out there, and they are not interchangeable. Similarly, the number and type of connections provided by the power supply must match your computer’s needs. Make sure the machine is well ventilated. Using more power means generating more heat, and that has to go somewhere. That’s what ventilation is for. Even for your existing, working system, make sure things are well ventilated. Make sure the fans in your machine are working properly and that the airflow path is unobstructed. Overheating due to blocked airflow may be the most common cause of computer hardware failure, in particular the power supply itself. If you have a laptop, you’re out of luck. Laptops come with the batteries and power supplies they come with. There’s no real way to “upgrade” their power capacity. Can I Use a Power Supply with a Higher Wattage Rating on my Laptop? - The voltage and polarity of the power supply must match. Amps and watts have some flexibility. Can I Use a Charger that Provides the Same Voltage but a Different Amperage? - Chargers and power supplies come in a wide variety of configurations. Choosing the right one is important. I'll look at a few of the parameters. If Shutting Down Windows Cleanly Is So Important, What Happens When the Power Just Goes Out? - We're all told to shut down Windows before turning power off, but what if the power just goes out? If you're not protected, bad things can happen. Will I Lose All Data When My Computer Crashes? - It's incredibly rare for a software crash to damage any drive connected to a computer. Other things, like a lightning strike, can do serious damage. Speaking of “peak usage”, I have a friend whose computer would work just fine — until he tried to burn a CD, at which point the system would fail. It turns out he upgraded from a CD-ROM to a CD-R drive, and the original power supply had just enough power to run the system as-built. The extra power needed to write to a CD-R pushed it over the limit. I replaced the power supply with a higher-wattage one, and everything was fine. Look at these power supplies. Many of the replacement power supplies that are recommended are actually much higher wattage than the original power supply. I want to upgrade my computer power supply, do I have to buy the same physical size? or does it matter? I try searching for one that the same size but they all diffrent sizes, am afraid I buy one and it wont fit? and does the brand matter since there so many.. I have a Dell Dimension 4550 running XP, 1Gig RAM, Intel P4 3.06HT, Seagate 160Gig HDD. Recently I bought a BFG Geforce 7800GS OC. My PSU was only 250w and the card requires atleast 350w. So I went out and picked up the 800w BFG PSU to power the card and everything else. I start notice that when I put my machine on Stand-By for the night, I come back in the morning and the machine won’t come back on. All the while, I know that the machine is powered up b/c I can hear the fans going. I have to do a hard boot. Then I start getting random reboots, the situation progrssively gets worse until one day I go to my office b/c I hear this rattling sound, it’s the PSU. I turn the machine off, open up the box, take a look at the PSU, I smell it but it’s not burnt. As soon as I try to reboot, I see a flash come from the PSU; it died. It has a lifetime warranty, thank God, so I call BFG and then send out a new one. I start to put the machine on Stand-By to test if the same thing happens. It doesn’t, atleast not yet. A week goes by and even though I don’t get the random reboots, my machine won’t come out of Stand-By. The monitor is black, I wiggle my mouse, press some keys and nothing. Meanwhile the machine is on b/c I hear all the fans going. I have to do a hard boot. I call BFG again and they explain to me that they can change PSU again but the chances of the replacement being bad too are “astronomical”. I agree to a certain extent. So I call Dell and they say that the machine can only handle a 250w psu. Now here’s my question (finally right?!) I believe it’s true that “It’s better to have too much power than too little.” and I believe it and understand how psu’s work, why is Dell saying that my machine can only use a 250w psu? I don’t get it. Can anyone help with this? Dell usually goes by what the Specs say, but I would have suggested for you to go around 500W rather than 800w. I would also check for any OS issues, you can look at Event Viewer to see what’s going on, that could also be your Video Card. Its possible that the Motherboard is drawing more power then it can use, I suppose… say the old PSUs Mobo connector was only good for X Watts and Y Amps, but the new PSU can put more then that to the mobo. Would be very poor design to limit the Motherboards power draw by using the PSUs Rail limit, but if Dell’s giving you the run around, I wouldn’t be shocked. It’s possibly the the PSU regulator, which may not be able to handle less than some minimum load. As you mentioned it only happens at standby, which pulls very little load (components within the system are designed to either shutdown or stay kinda asleep using very lil power. For e.g. some processors advertise they will take up say 2 Watts in standby while 65 watts in active condition). The trouble is, the PSU manufacturers may not advertise the minimum required load and hence even if the manufacturer sends you a new one it may work the same way as before in standby conditions. So, I think having a bigger power supply is not the problem. Either shut down your computer after using it or find a power supply that can sustain very low power usage. HTH. Just to make sure you understand this fully, if your system requires 5 watts in standby while the PSU regulator can go as low as 10 watts, the extra 5 watts will still be dissipated somewhere! Not sure if there is an easy way to calculate the power usage when system is in standby but am sure there are good power supplies out there which can be functional even in a no load (i.e. 0 watts) condition. 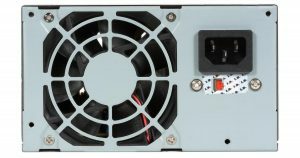 so if my computer has a 300 watt power supply and i put in a new 750 watt, it will over heat. Is that a question? It’s unlikely. It depends on the computer, the power supply, what other hardware is in the computer, the venting and how you use the computer. I have to disagree with the statements regarding to big of a PSU. The components use what they want from your PSU, it doesn’t force more in. The PSU isn’t “Burning off the extra” it simply has the capability to perform at higher wattage’s if needed, yet will only supply what your components want. They want 200watts then the PSU provides 200 watts, got a honkin grafix card that means you need 400watts you get 400watts. If you have an 800watt PSU it doesn’t sit there with 800watts of potential energy stored in it dissipating the extra in the form of heat. It only means it has the capacity to do 800watts. I’ve been running a 750watt AERO PSU in the same rig for going on 8 years with no issues caused by the PSU. I had one motherboard that fried a capacitor and later found it to be a design flaw in the IC7 from ABIT (thank god they are gone! ), so to remedy I installed the IC7 Max3 which has a fan and ducting over the capacitors. I also originally had a EVGA FX5700LE card and changed it to the EVGA 7800GS which required a 4pin molex so I was glad I had installed the 750watt supply. Now my son has this computer and I see no reason it shouldn’t last another few years for him, I just inspected everything and it looks great. It’s now running WIN 7 Pro and has a Autobot Bumblebee theme to the case and the system. My new rig is running a Kingwin 1220Watt in it, staying cool too. Great product by the way! You want to upgrade your PC’s in the future buy good parts first, don’t scrimp on some cheap brand, just go find a good deal on a good brand. Next time don’t buy a pre-built PC if you want gaming, get one built or build it yourself with the right stuff to game! You waste more time, money, and effort with upgrading a Name brand PC to do something the manufacturer never intended it to do. This is what I was looking for, a clear, concise answers to my questions about power supplies. Danke! I’m not new to computers or building them, at all, but there are some things I never got around to learning everything about; power supply units are a good example of such a thing. I came here, because I have recently ordered a state-of-the-art gaming rig, since I can’t be bothered to build one. I have concerns about whether the PSU will be safe and reliable, as it is a Dutch make and put in a computer that will be shipped from Germany, via Amazon, for over £400, although it’s worth easily over £800! The PSU I’m concerned about, is the “Techsolo STP-650” that, according to at least 2 sources online, is indeed certified (CE) but I need to KNOW, for sure, first, otherwise I will have to just fork out for a Corsair. Any advice, please share! Viel glück mit ihre Computer, leute! Agree with your answer. on high memory machines, the power supply may be just adequate and thus a slow machine. my example is the Asus CG1330 with a supplied 400 watt power supply for 8 Gig of memory. Must purchasers increase the power supply to a 600 watt and then have a machine worth speaking about. Increasing the memory to 16 Gig may require an increase in the power supply especially if one increases number of monitors. I have a custom machine with a 1800 watt supply that sits in the bottom of the case. As long as you have a supply bigger than what the machine draws no problem. Hi, I have a Q6600 with 2gtx550ti’s, 8gb ram, 3hdd’s and 1 dvd drive. Cpu cooler master V10.My power supply is a 550W. Is it enough? You can upgrade your power brick for laptops.